Since the global financial crisis struck in 2007, Greece’s structural problems in combating corruption and prosecuting guilty parties have been widely reported. These shortcomings are fueling new efforts to achieve political accountability in a country still struggling to recover economically amid persistent citizen unease. Included within this ambitious agenda are hopes to develop the country’s first comprehensive whistleblower protection law. Minor provisions were passed in 2013, but they are not known to have had any measurable impact. The Southeast Europe Coalition on Whistleblower Protection is supporting efforts by the OECD to develop new policies and tools to assist Greek officials in their anti-corruption efforts. 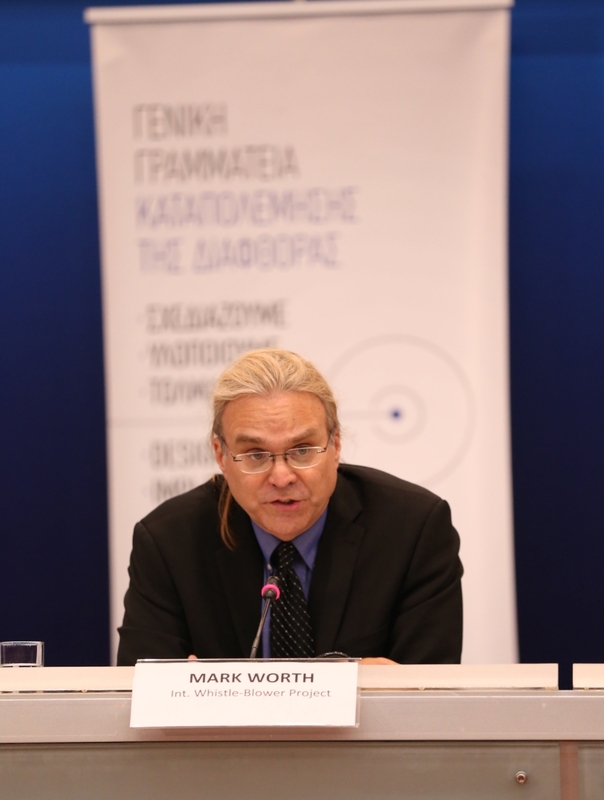 ECWR Executive Director Mark Worth spoke on the importance of whistleblower protection at Greece’s first-ever multi-stakeholder Public Integrity Forum, hosted by the OECD in Athens in July 2017. As a follow-up, the OECD organized a series of roundtables with activists and experts in October 2017 to formally begin the process of developing new policies to promote and protect whistleblowing. The Coalition is supporting the OECD and Greek policy-makers in this initiative. The Center for the Study of Democracy has worked to strengthen a proposed anti-corruption law that includes provisions for citizens to report misconduct. The Center is a member of a consultative council run by Deputy Prime Minister Meglena Kuneva, who has spoken in favor of citizens’ rights to report corruption. Adopted by the Cabinet in March 2016, the law would unite four government institutions into a single anti-corruption agency whose duties would include protecting whistleblowers. Parliament blocked the measure in 2017..
For 20 years, the UK’s whistleblower protection law has been praised as among the strongest in the world – including by whistleblower advocates themselves. The truth about the law, however, does not support the myth. Far from being the "gold standard," the UK’s Public Interest Disclosure Act contains many loopholes and flaws that leave employees open to career ruin, financial losses, character assassination and huge legal fees. Whistleblowers have suffered defeat in Employment Tribunals that often favor the rights of employers over those of workers. Former UK Parliament Member Lord Touhig, a co-author of the original law, recently called the law "dangerous for whistleblowers because people think they have stronger protection under it than they actually do." “Protecting Whistleblowers in the UK: A New Blueprint” is serving as a road map for reform. In particular need of improved protections are National Health Service employees who have suffered extreme reprisals for disclosing poor care in hospitals and clinics. Hungarian lawmakers attracted widespread attention in 2014 when they passed a new whistleblower law in 2014. Upon close inspection, however, the Act on Complaints and Public Interest Disclosures provides virtually no protections for employees and citizens who report crime and corruption. Dangerously, such laws can serve as a trap for people who think they will protected after disclosing sensitive information – only to learn they have no legal recourse if they are fired, harassed, sued or prosecuted. The Southeast Europe Coalition on Whistleblower Protection, a Change of Direction partner, is exposing these and other weaknesses with the law as a first step toward strengthening rights and protections. According to Coalition member K-Monitor, a Budapest-based NGO that specializes in anti-corruption and citizen participation, Hungary’s Ombudsman often forwards reports and complaints to the very same ministry or agency that is responsible for the misconduct. This lowers the chance that reports will be objectively and thoroughly investigated, and that guilty parties will be held to account. Finland has cultivated an image as a world leader on the principles of government transparency and accountability. Yet, it still lacks a designated law to protect whistleblowers and clear channels for whistleblowers to disclose wrongdoing. In June 2016 a working group empaneled by Finland’s Justice Ministry concluded that current laws are “to some extent fragmented and often indiscernible.” Specifically, the group said it is unclear how whistleblower protections are implemented and by whom, that workplaces and authorities have not discussed the forms or duration of retaliation protection, and that tools are not always in place to protect employees. The system is so weak that the group found the only way to “protect” whistleblowers in certain cases has been simply to suspend an investigation. Despite these findings, the Ministry’s working group said Finland's current systems are “fairly good where whistleblowers are subject to retaliation.” The group said it did not see an “immediate need” for a separate whistleblower law. ECWR activists have engaged with Finnish officials and will begin a public and media campaign toward convincing lawmakers to pass a strong whistleblower law to correct the serious problems that officials admit exist. Joining the EU in 2013 required Croatia to embrace wholesale legislative reforms in order to meet European standards. Five years later, however, the country still lacks a specific law to protect whistleblowers. Nor does it have a designated public agency to receive and investigate whistleblower disclosures and retaliation complaints. Croatia’s poor record is at odds with public opinion. Sixty-eight percent of citizens think whistleblowers should be supported, according to a 2017 survey by the Regional Cooperation Council and the NGO Blueprint for Free Speech. This is tied for the highest figure among seven countries surveyed. The stalemate could change soon. In June 2017 whistleblower protection was included in Croatia’s official Anti-Corruption Strategy, which laid down a goal to pass a law by end of 2018. GONG, Center for Peace Studies and Human Rights House Zagreb have campaigned aggressively for the law and helped draft the Anti-Corruption Strategy.